Most modern American plays strive for streamlined brevity, a slick, no-frills writing style focused solely on moving the story toward a succinct climax. While this obsession with shortness may ease the burden placed on theater-going behinds, it cheats our imaginations of the rich, luxurious language and character-driven storylines from which great art often springs. Last week, two impressive plays opened in the North Bay, each an example of the kind of lush, dialogue-driven storytelling we rarely see anymore. Both plays are just under three hours apiece—and worth every magnificent minute. Marin Theater Company begins its new season with a perfect staging of August Wilson's celebrated drama-mystery Seven Guitars. No other playwright of the last few decades has produced a body of work as committed as Wilson's to telling juicy, full-length, lived-in stories—in his case, stories chronicling the lives of African Americans across the 20th century. Set in 1948 in a working-class backyard within the Hill district of Pittsburgh, Penn., Seven Guitars begins at the funeral of Floyd "Schoolboy" Barton, a local blues player whose dreams of fame and fortune have been cut short, his apparent murder still under investigation. In flashbacks, we follow Floyd (played by a superb Tobie Windham) as he attempts to put the pieces of his faltering career back together. A year previous, he recorded a blues record in Chicago. While waiting for the record company to release the tune, he found himself unfairly sentenced to 90 days in jail. Upon release, with his song now a huge hit on radio, Floyd is desperate to get back to Chicago for another stab at the big time but finds his progress stopped by an endless string of roadblocks. 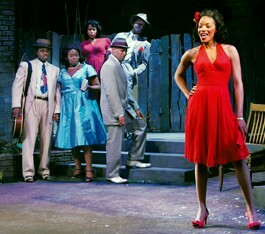 All of this plays out in a series of backyard conversations, Sunday dinners, casual get-togethers and fateful encounters, with Floyd's immediate circle of acquaintances each presented as his possible killer: the wounded former lover Vera (Omoze Idehenre, sensational), the tough-as-nails landlady Louise (Margo Hall), the sometime band mates Red Carter (L. Peter Callender) and Canewell (Marc Damon Johnson), and Hedley (Charles Branklyn), an oft-delusional, chicken-slaughtering mystic who rails against the casual cruelties of white culture and prophesies the violent rise of "the mighty, mighty black man." The story unfolds at a wonderfully leisurely pace, as Wilson's shimmering script and Kent Gash's humane direction shine a spotlight on every vivid and vibrant character, illuminated by gorgeously crafted dialogue and soaring monologues that linger long after the play is over. In Harold Pinter's Caretaker, just opened at Santa Rosa's Imaginists Theater Collective, there is a similar commitment to character-over-concision. Brilliantly acted by Brent Lindsay and John Craven, with strong support work from Tyler Costin and the knowing directorial eye of Elizabeth Craven, The Caretaker is a blend of absurdist nonaction and breathtakingly offbeat human observation. Davies (the "caretaker" of the title, played with ever-shifting wiliness by Craven) is elderly, homeless and given to opportunistic flights of compulsive lying. Following a scuffle outside a pub, Davies is offered shelter by Aston (a truly sensational Lindsay, never better), a kindly fellow with a streak of social awkwardness that gradually reveals itself as a type of trauma-induced brain damage. Cautiously accepting Aston's offer of a bed for the night, Davies soon finds himself in the middle of an odd triangle as his host's intimidating brother Mick (Costin, all threatening stares and melodiously unsettling intonations) suddenly arrives to question Davies' presence in his brother's flat. Though little happens in the way of plot, much is revealed nevertheless as this twisty trio slowly reveal surprising truths, fabrications and funny, unexpected memories. The sheer artistry of the language and the calm mastery of the performances make The Caretaker a long, strange trip worth taking. 'Seven Guitars' runs through Sept. 4 at Marin Theater Company, 397 Miller Ave., Mill Valley. Showtimes vary. $34-$55. 415.388.5208. 'The Caretaker' runs through Aug. 28 at the Imaginists Theatre Collective (461 Sebastopol Ave., Santa Rosa), then runs Sept. 16-25 at Main Stage West (104 N. Main St., Sebastopol). Showtimes vary. $12-$20. 707.528.7554.